This is a report on a recent attempt to define the semantics of the input language of gringo in a mathematically precise way. This project has led the designers of gringo to the decision to make some changes in its functionality, and it helped us improve our understanding of the relationship between the language of gringo and the ASP Core standard. 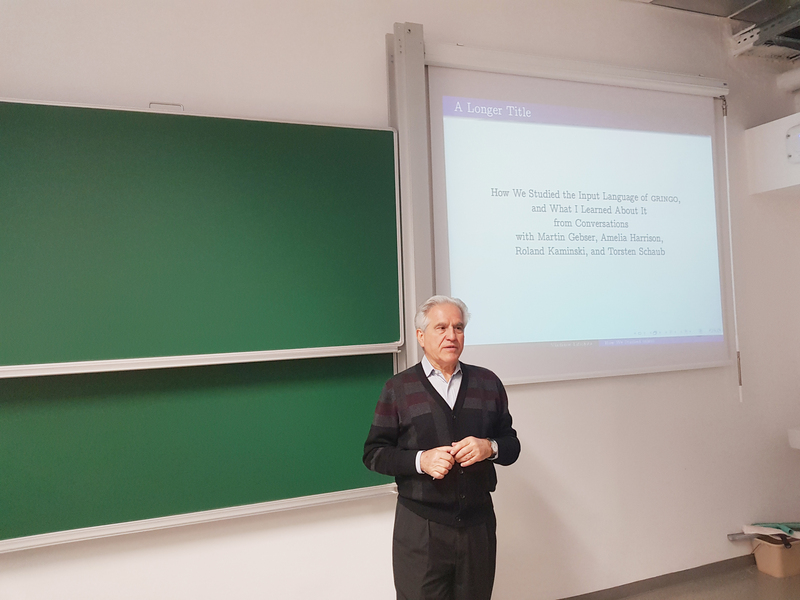 Vladimir Lifschitz, University of Texas at Austin, invited talk at the Workshop on Trends and Applications of Answer Set Programming – TAASP 2018. Vladimir Lifschitz is among the most influential scientists in the field of Artificial Intelligence (AI). He started out his work at Stanford with John McCarthy and made significant contributions in the area of Non-monotonic Reasoning (NMR). This can be seen a precursor to his later groundbreaking work connecting NMR with Logic Programming that led to the definition of the stable models semantics, and thus the initial foundations of Answer Set Programming (ASP). Interview with Vladimir Lifschitz in KI – Künstliche Intelligenz 32(2-3), 213-218. Available here. Thomas Eiter and Stefan Woltran.